I initially thought this book was about FREE MOTION QUILTING… but it is so much more! I goes into in depth explanation of using NEGATIVE SPACE effectively in your quilting. I highly recommend it to those quilters who want to study design for quilting. I just got this book in the mail. I had a previewed it at a sew-in I went to earlier this month. I did not get the chance to read the entire book but I was enthralled by what I did read. Ms Price several different NEGATIVE SPACE DESIGN TECHNIQUES: Gradation, Reversal, Interruption, Negative Form, Ghosting, and Piecing. She supplies several quilts to demonstrate each of the techniques she explains. The picture of the quilts are great showing the entire quilt and close up of the free motion quilting. The quilts have a definite MODERN ascetic and some of the quilts are improvisational, while others are of a more defined pattern. Ms Price discusses how values and colors are used in modern quilting. 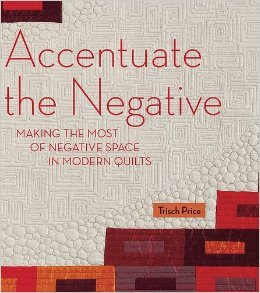 This is one of the first books about modern quilting where more than patterns are given. Ms Price’s book gives some of the first instructions in design principles of modern quilts. There might be other books out there that give instruction in modern design ascetic but I have not found one. Most of the books I have read are more pattern books without any in-depth design instruction. For the instruction in this book I can recommend it if you want to learn how apply the principles of design to modern quilts. I gave the book 4 stars in GoodReads but I will revisit my review per my habit after I have read thru it and apply what I learned. I do have one major complaint about the book, but it is directed at the publisher and many of the other publishers that print their books with small, grey hard to read fonts. I resent that I have to use magnification to read a book… I feel they are trying to hide good information. I personally think that publishers have no consideration for their readers. They are trying so hard to be hip and trendy they forget to be considerate of their readers. I try to safe guard my vision after all I need it for quilting. AND Yes, I will be writing the publisher and tell them what I think of their publishing practices. After all this blog is about rants and raves! I bought this book on Amazon and the problem with Amazon is you cannot preview the book effectively. When you buy from a local quilt shop you can flip thru the books and see what type of quilt patterns or technique is being taught. YOU come away with a better idea of what you are paying for. On Amazon you are buying a pig in the poke…. It can really get a surprise because you cannot tell what kind of projects are in the book. To be honest (my bad) I went by the cover as I though those blocks were lovely. I expected to have more quilts / projects in the same style. Instead of MODERN STYLE of blocks that are done by applique I found a more FOLK ART style of projects. Motifs that I have seen for years … fish, baskets, hearts, birds, trees. To me the style of these motifs are more folk art then modern. Are they modern motifs I am not entirely sure. She does have some abstract quilt motifs of flying scattered triangles, a project with flames and another projects of circles. 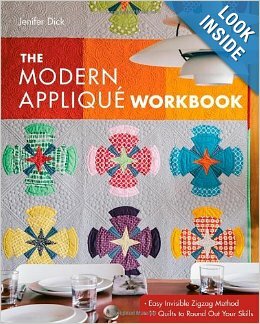 This book, MODERN APPLIQUE WORKBOOK, is picture heavy, in that there are a lots of pictures and visual explanation of the techniques and instructions. Jenifer does a good explanation of the various supplies you need and how to use them. She goes into details on how to prepare your background and applique fabrics. She shows close up pictures of several stitch styles to anchor the applique to the background fabric: blind hem stitch, plain straight stitch, triple straight stitch, zig zag, scribble stitch, blanket stitches and feather stitch. She laces the pages with helpful hints, my favorite was a design tip on modifying a commercial / published motif to match the level of your skill rather than stressing out over a too hard / intricate motif. As she said your skill level will improve over time. For a brand new quilter who wants to learn applique I would recommend some of the older workshop books that have multiple techniques. I have listed several below. Of the eleven projects in this book I may make my own version of three projects. Would I buy the book again… probably NOT. I had been on the look-out for a book with modern applique motifs. I cannot decide if it is the motifs in this book or is it me, as I have only found a one or two motifs I would like to replicate. I have found my best source for modern applique motifs have been the 100 Quilt Blocks Magazine that is published once or twice a year. They also publish a magazine of quilts made from the patterns from the 100 BLOCKS MAGAZINE. I rate books on a 5 star system, I would give this book a rating of 3 stars. I will wait a while then review this book again. Penny Haren’s, PIECED APPLIQUE .. Intricate blocks made easy! Ms Haren developed her own method of duplicating pieced blocks using applique. I have made several blocks using this technique. I do prefer piecing to this style of applique… but I have found it a useful technique when I wanted to hide a mistake… DO NOT ASK. BETH FERRIER developed HAND APPLIQUE by Machine technique. She has a series of books and pattern that use this technique extensively. The motifs range from folk art / simple to detailed. Mostly floral motifs. Any of Jane Townswick and Bea Oglesby have multiple books mostly floral, nature, realistic motifs. Earlier books have instruction in how to applique but later books have little or no instruction in applique as they expect you to know how applique. Machine Applique for the Terrified Quilter by Sharon Pederson… a DVD is also available. She has a broad range of applique motifs from traditional to more contemporary. OFF TOPIC > Can anybody tell me what is the difference between Contemporary and Modern Quilts? I am totally confused on that aspect of quilting and the differences between those style of quilts. RESOLUTIONS 2014 UP DATE for QUILTING for the REST of US …. Last year I said I would only make quilts for me and mine… not one was made… This year it has become a PRIORITY … our beds need quilts really bad. SO THIS YEAR … I am only going to make the quilts I want to for my immediate family … other quilts and UFOs will be worked in between the QUILTS I HAVE BEEN DREAMING ABOUT. I will not feel guilty if they do not get done… no more baby quilts for me.. unless I want to make them … . Blocks are completed … ready for assembly into the quilt. I plan to do the same and have the long armer just do the stitch in the ditch around the blocks so that I can do the main FMQ. I hope to really improve my FMQ. To that end I have been reviewing my FMQ classes on Craftsy and practicing on batts… I have so many placemats and pot holders right now. Gave some to my sister and to my surprise she sold them in her second hand shop. Hey a new income source…. hee hee. I need to finish the last of the baby quilts that I owe to my niece’s child… more FMQ. These are actually toddler size quilts as I make them 50 x 50 for napping. MY grandson is demanding a new quilt and by golly he needs one. He has been picking out fabrics that he likes…. Golden book panels, sport fabric and SUPER HEROS… how I am going to get them all into one quilt….. I HAVE NO IDEA. My daughter graduates from college after 7 long years…. YEAH ! ! ! She wants to move into her own home so she would like a new quilt for her bed. She has picked a RICKY TIMS KOOL KALIEDOSCOPE quilt pattern. She is waffling on the background color… Black, Navy or Charcoal Grey . This one will be started some time this summer. Yes graduation is this spring but THEMS THE BREAKS… I will not be ready to start on it til then. The medallions will be easy to work on but they do take a lot of drafting and energy with the cutting aspects of this pattern. “I find the favorite part of the quilting process is FMQ… I find such joy in doing the FMQ… it is my favorite part… I will continue to follow the CRAFTSY classes & DVDs to learn the technique but I am going to do more of my own… I do not see it as a chore at this time… more of a pleasure… I am not very good but I do not care … I WILL GET BETTER WITH PRACTICE. As stated in the above post I have been working on my FMQ … practice, practice, practice. I have recently purchased a new FMQ book. I have been collection all the FMQ books I can find, especially the ones noted to be MODERN. 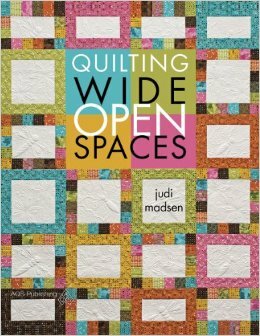 I am enjoying JUDI MADSEN’s book, QUILTING WIDE OPEN SPACES. Added bonus is the cD of patterns that is included in the book. Judi is a long arm quilter known a GREEN FAIRY QUILTING ( links below.) I have been following her post for several months and enjoy them immensely. She has some beautiful motifs and uses fillers in an interesting manner. She has a MODERN style to her FMQ and incorporates many different patterns in one quilt. I like this style better than the entire quilt quilted in one pattern. I think it adds more movement to the quilting. Every quilt pattern shown can be done on a domestic machine. Judi has some good instructions for quilting on a long arm, but I bet new long armers would have liked it if she went into more depth. I do like some of her pictures showing DO-s and DON’T-s in FMQ. THE cD is what gave added value to this book along with the close up pictures of the quilting…. NOW to incorporate all I have read into my own quilting… WISH ME LUCK. FINDING more time to do my quilting … this has been hard for me. It is usually why I only get small projects done. I make one big quilt a year as when I get home from work I am too tired to sew. I think I am going to go back to the 15 minutes a day … or as TILDE use to say … ONE THREADFUL NEEDLE … I will need to set up my sewing area really but this is something that has worked for me in the past and will work for me in the future. I have not had the opportunity to sew even 15 measly minutes a day. I have been able to sew in larger chunks on the weekend so I am making progress. I am currently working on two projects. The NURSE RETIREMENT QUILT, almost finished the piecing and need assembly next. I also hope to have my niece’s baby quilt assembled and ready to layer in order to FMQ. I have a ALL DAY SEW IN this Saturday at the Guild’s Center and think I only want to do FMQ. I plan to bring two projects that require FMQ. Although I am debating this as I might bring my NURSE QUILT to start assembling… LOOK FOR A FUTURE POST WITH PICTURE.